Monday to Sunday, 24 hour service for 7 days a week. Companionship – One of the most important aspects of FIRST CALL HEALTH AND HOME CARE will be providing customers with a strong sense of family and compassion. Taking an interest in the customer, their life and their environment will create an everlasting bond. Whether it is playing a favourite board game or card game, reading, taking a stroll or visiting with friends and neighbours, life is meant to enjoy. Light House Cleaning – similar to a housekeeping or maid service, the Home Worker will provide dusting, damp mopping hardwood and flooring, vacuuming carpets and furniture, changing bedding, scrubbing the bathroom and general tidying of living spaces as required or requested. Laundry – From pre-washing and washing to drying, ironing and folding. Kitchen Maintenance – The caregiver may not wear a chef’s hat but they do know their way around a kitchen. Meals can be planned in conjunction with a nutritionist or with the customer. Grocery planning, grocery shopping, dish washing, food maintenance, and cooking will fill the house with the welcoming aromas of everyone’s favourite foods. Attendant/Driver Service – If mobility is a concern, the caregiver can attend any function, appointment or errand with the customer. Whether it is to a local sporting event, family gathering or shopping excursion, the customer will have the added security of someone to lean on. Depending on arrangements, travel is by taxi or the caregiver’s vehicle. The caregiver keeps a client schedule so that important appointments are not forgotten. Home Care Services Basics – This covers all the basics of looking after a home such as gardening, arranging lawn mowing or landscaping, garbage control, heat and utilities checks, watering indoor plants, replacing light bulbs and everything else that may have at one time been addressed by the customer. Pet Care – A pet is sometimes the best therapy to fight loneliness, depression, medical problems or stress. The caregiver will ensure the pet is always as happy as the customer. Cleaning, feeding and exercising the pet will be part of the day’s activities. Basic Personal Care – Washing, help with pre-poured medicine, personal hygiene, nail care, hairdressing, picking out co-ordinated outfits, help getting dressed or applying makeup. The caregiver will take the best interests of the customer at heart. Alzheimer’s nurturing – The number of men and women experiencing mild to extensive degrees of Alzheimer’s is increasing and is expected to reach epidemic proportions. As Alzheimer’s progresses it becomes increasing important to keep the patient in familiar surroundings. Unfortunately, this puts a tremendous strain on the family both mentally and physically. FIRST CALL HEALTH AND HOME CARE understands this and works closely with the patient and family members to ensure comfort for all involved. Health workers specializing in the unique issues of Alzheimer’s will be assigned to enrich the patient’s daily living. Foot Care – Usually misunderstood in importance, FIRST CALL HEALTH AND HOME CARE realizes the complications associated with improper foot care. Whether a result of diabetes, vascular disease or neglect, the foot requires careful attention for continued comfort, mobility and infection control. Services included are nail cutting, corn and callus control, infection cleansing, and appliance or pad application. Postpartum support for mothers and newborns – Our postpartum mainly helps the parents learn to care for and integrate with their newborn. Our midwife or Caregiver usually builds the confidence of the parents, allowing them to care for their newborn independently, very quickly. Our experienced midwife has experience with multiples, premature babies and “fussy” babies and she may help with household tasks such as laundry, food prep, light cleaning and childcare to allow the parents time to rest and relax. Further, we can also help with breastfeeding, community resources and informational support for family decisions. The main focus of postpartum care is helping the parents integrate the baby into the family. Medication Management – Administering drugs by a qualified nurse is essential in maintaining the health of a patient on medication. From diabetes and high blood pressure to disease management and pain management, drugs require control, measurement and administration in an exacting environment. FIRST CALL HEALTH AND HOME CARE health workers adhere to strict standards set forth to ensure the wellbeing and comfort of the patient. Wound Care – Accidents or progression of disease create situations where preventative management is required to fight infection and further disease. A Health Worker can work in conjunction with the case physician to make sure wounds are kept under control to facilitate healing. Basic Personal Care – Bathing, washing, and other personal hygiene cares can be provided to ensure cleanliness and dignity are maintained. Palliative Care – One of the most sensitive areas in health management is caring for a friend or loved one whose prognosis is grim. A comfortable family home allows the loved one to spend their precious time in surroundings full of love and memories. 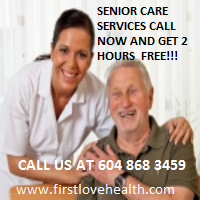 FIRST CALL HEALTH AND HOME CARE can help with the arrangements to make this possible. Whether as respite care to allow loved ones to take a break or as round the clock loving care, our FIRST CALL HEALTH AND HOME CARE Worker will be there with passion to serve you or your loved one!